The SM5000 sampling module and PS5000 power supply are the newest accessories for use on the ULTIMA X5000 and GM S5000 Gas Monitors. Read the full article to access. We are pleased to announce the release of the SM5000 sampling module and PS5000 power supply for use on the ULTIMA X5000 and General Monitors S5000 Gas Monitors. 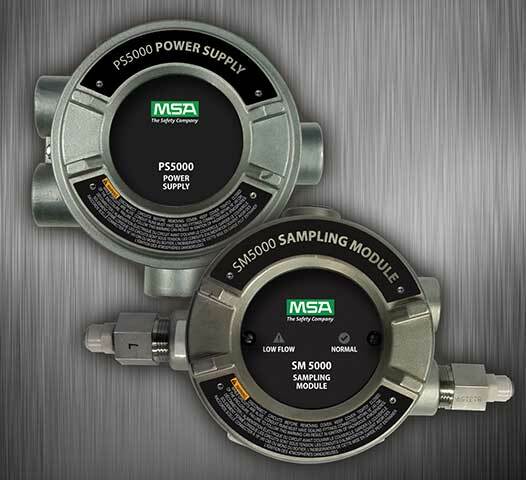 The SM5000 sampling module may be used to monitor combustible and toxic gases in ducts, wet wells, and storage tanks. High humidity and particulate filters are available to treat the sample gas before delivery to the sensor. The SM5000 is supplied in two forms, an aspirated model that can be actuated with a compressed air source (p/n 10058101) and a DC pump module (p/n 10043264). Both are able to draw sample gas from 0.5 LPM (1CFM) to 1 LPM (2 CFM). The PS5000 power supply (p/n 10053967) is a 24V DC that allows the X5000/S5000 to be powered with 120 VAC. Both the SM5000 and PS5000 are rated for explosion proof environments. For more information, please contact MSA Customer Service 1-800-672-4678 or visit www.MSAsafety.com.